After four years of treatment the exterior wing panels of the Ghent Altarpiece and their frames have returned greatly transformed to St Bavo’s Cathedral. 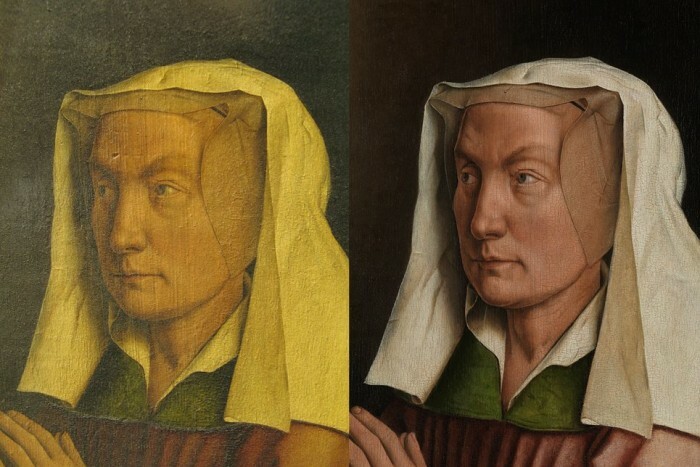 The restoration by the Royal Institute for Cultural Heritage (KIK-IRPA, Brussels) has led to the rediscovery of the unique painterly qualities of Van Eyck, which had been hidden beneath overpaint for centuries. The restorers’ complex task is illustrated by the catalogue restoration/REVELATION and the eponymous exhibition at the Caermersklooster Provincial Cultural Centre. When the restoration started in October 2012, it had been planned to remove the relatively recent retouching and oxidized modern varnish, consolidate the paint layers and conserve the supports. The restorers, however, gradually discovered that the paint layer was covered by very large zones of overpaint, the existence of which had been unknown for centuries. These later additions dated from the 17th or even from the 16th century. 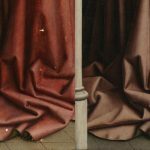 This means that the exceptional quality of the closed Ghent Altarpiece hadn’t been visible for more than 400 years! 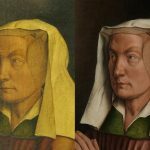 Detecting the overpaint hasn’t been straightforward: they were hidden beneath yellowed varnish, their quality and state or conservation varied significantly, they covered entire zones of the originale composition that they imitated, and their age cracks were similar to those in Van Eyck’s underlying underlying paint layer. Additional research by the restorers and laboratories of the KIK-IRPA and by the universities of Ghent and Antwerp revealed that the overpaint, which covered around 70% of the surface, could be removed without damaging the original paint layer. The advice of the International committee of experts to uncover the original was put into reality. 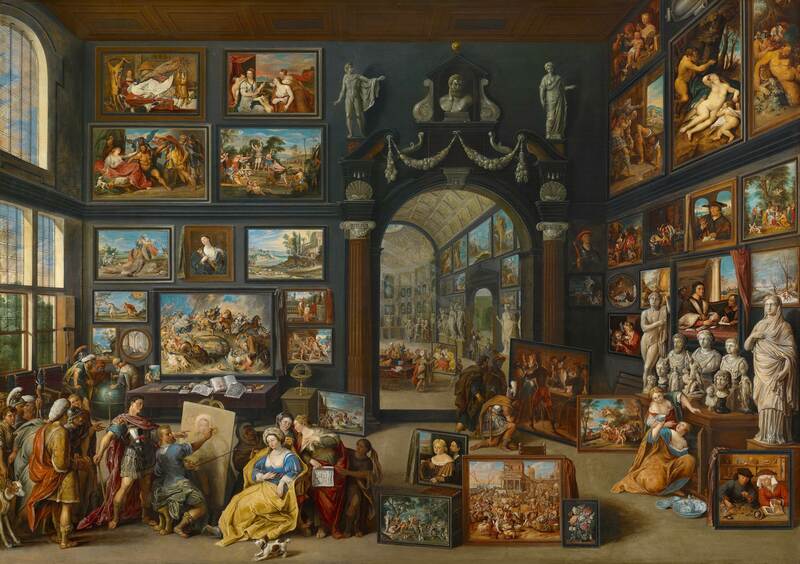 Such a large-scale removal of overpaint, however, demanded additional time and a great amount of expertise and patience to remove the paint centimeter per centimeter with a scalpel under a binocular microscope. But the result lived up to the expectations: the original paint beneath the overpaint was in good condition, with only few zones with wear or losses. The restorers then started retouching, which was carried out progressively and with much care in order to obtain a harmonious result for all the panels and to restore the subtle modeling of Van Eyck. It is a particularly rare experience to witness the renaissance of an art work nearly 600 years after its creation (1432). The treatment has led to unique iconographic and aesthetic revelations. The panels are now much closer to their original appearance and show new iconographic elements. 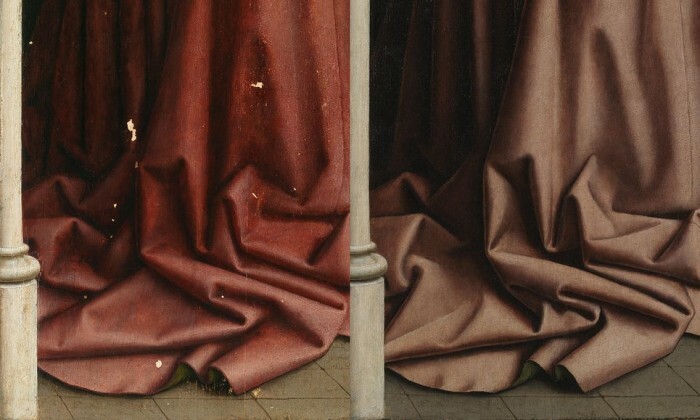 The restoration has also revealed the beautiful painting technique of the Van Eyck brothers, with their unequaled sense of observation and thorough insight into the interaction between light and materials, enabling the creation of a unique illusion of three-dimensionality on a flat surface. The role of both brothers in the creation of the Ghent Altarpiece is confirmed by the authenticity of the quatrain on the frames of the exterior wings. Meanwhile the panels of the opened altarpiece’s lower register have been brought to the restoration studio at the MSK where the public can follow the treatment from up close. Scientific imaging has already enabled the restorers to detect numerous overpainted zones on these panels. The restorers will further study the overpainted zones during the next few months, a period which will be highly decisive for determining the further course of the treatment. The Flemish Minister of Culture, Sven Gatz, has announced that If further study by the restorers were to show that additional restoration work is necessary, I shall find a solution for this in consultation with the Government of Flanders. The KIK-IRPA pleads for a thorough restoration of the panels of the closed altarpiece, to bring them in harmony with the exterior wings and to reveal the real Van Eyck to the fullest. Tourism Flanders is also preparing an ambitious exhibition at the Ghent Museum of Fine Arts and will build a new visitor centre in St Bavo’s. The exhibition restoration/REVELATION. The exterior wings of the Ghent Altarpiece, until 28 May 2017 at the Caermersklooster Provincial Cultural Centre, brings the unique story of the past restoration phase. The exhibition climaxes in a life-sized video projection of the exterior wings condensing four years of restoration in a few minutes. The catalogue, with its generous selection of images from before, during and after restoration, is the first publication to present the newly restored panels and frames as (n)ever before.